Brighton Implant Clinic welcomes two new Dental Lab Assistants. The groups newest dental lab in Guildbourne Centre, Worthing makes progress with the help of two new dental laboratory assistants. 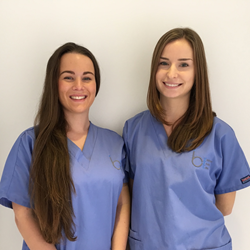 Two new dental laboratory assistants have joined the ever-growing team at the Brighton Implant Clinic’s newest dental laboratory in Guilbourne Centre, Worthing. Magda Hudzik and Emese Papp have experience in ceramics and making crowns and bridges for dental implants. Miss Hudzik and Miss Papp have hit the ground running, providing the latest techniques in dental laboratory procedures like CAD cam dental crowns and bridges. Miss Hudzik graduated from medical school in Krakow, Poland and gained her professional experience in a dental laboratory. To further develop her skills and knowledge, she enrolled in numerous additional courses and training. Miss Hudzik is diligent and detail-oriented. When she’s not in in the clinic working on smiles, she loves to be active – enjoying snowboarding and longboards - and is an extreme sports enthusiast. Miss Papp graduated from Szeged School of Dental Technician Hungary in 2014. She then built up her experience and expanded her knowledge base at the London Aesthetic Ltd. and Novadent Ltd. Her forte is with ceramics, metal/zirconia work and e max. In her spare time, Miss Papp enjoys cooking, traveling and participating in sporting activities.